Invitations have been sent, perks and swag are in place, we have our virtual red carpet rolled out to proudly announce a premier VIP event that doesn’t require a shirt,shoes or even pants! Are you tiering up? I promise this is not a ‘spell check slip up’ nor should you reach for the Kleenex Tissues— Tiering up, as in achieving VIP status via the RSI Rewards VIP Program. It’s the Invitation that you do not want to decline. The Guest List you want to be on. There are no committees to join or dues to pay! Almost as much fun as Fantasy Football but far less time consuming! No Restockng Fees! We will waive the 15% restocking fee on any shipment you return. VIP Promotions! 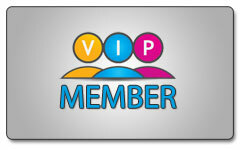 Get exclusive promotions just for being a VIP member. VIP Rewards! Redeem your points for exclusive rewards. Priority Support! A VIP Hotline access to a “VIP 800 number” Consider yourself moved to the front of the line to get the help you need when you need it. Dedicated Account Manager! Your own dedicated account manager to assist in all of your shopping needs. Plus you will earn Immediate Bonus Points just for achieving VIP status and Earn Extra Bonus Points for every purchase you make! What do you need to qualify, where do you sign up? It’s SO EASY! First,if you have not already signed up for RSI Rewards please follow my link and do so. If you are already an RSI Rewards member keep Shopping- collect two points for every dollar spent on merchandise and reach 5000 Points. That’s the magic number! VIP Perks are ready and waiting and we will send you a confirmation “Congratulations on becoming an RSI Rewards VIP member” email once you ‘hit the mark’ – so convenient! Remember after you make your purchases to write a Product Review! Reviews get you entered in chance to win a $100 Shopping Spree and drawing time is just around the corner!